The UAZ 469B is the civilian version of the ubiquitous 469 model military truck which means that it has all the amenities of a Russian car from 1980. This specific UAZ has the steering wheel from a Mercedes that not so subtly hints at the powerplant but also denotes luxury. It’s essentially a G-Wagen! 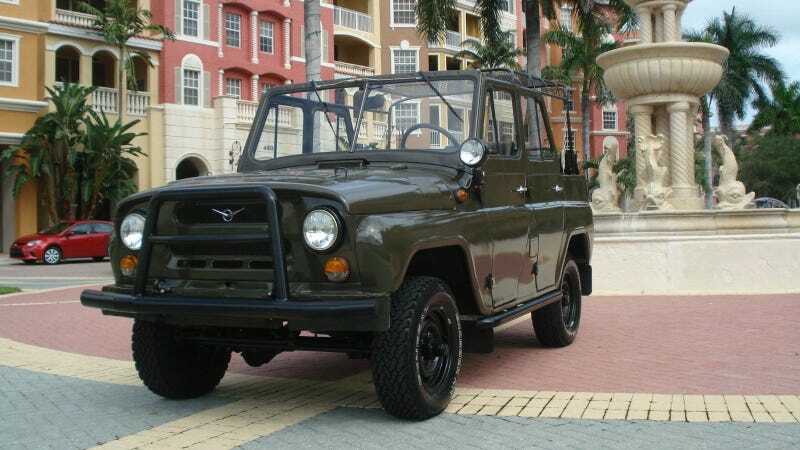 This UAZ is listed at $10,000 and is located in Naples, Florida. That may seem like a lot of money for a Jeep from Ulyanovsk but can you really put a price on a vehicle that will surely put a smile on the commissar’s face? Aside from the decidedly German hunk of iron under the hood, this former USSR staple seems to be in fairly good shape for the age. According to the seller, it only has 7,000 miles on it. That means it has plenty of miles left on it for your vacations in Kazakhstan.